ALOOOOOOOOOOOOOHA EVERYONE. AFTER A BRIEF THREE WEEKS ABOARD THE PRIDE OF AMERICA SHIP IN HONOLULU, WE ARE BACK ON THE EAST COAST AND ADJUSTING, ONCE AGAIN, TO THE EST TIME ZONE. (THANK GOD FOR MELATONIN) WE HAD A GREAT TIME ON BOARD, AND MET SO MANY PEOPLE FROM NOT ONLY THE U.S. AND CANADA, BUT ALSO SOME GREAT NEW FRIENDS FROM JAPAN, AUSTRALIA, GERMANY, CHINA AND MORE! THE BAND WE PLAYED WITH WERE INCREDIBLE TO WORK WITH, AND WE EVEN WORKED ON A NEW OPENING TO OUR THEATER SHOW (THANK YOU MARK FRENCH!). WE WERE TREATED SO WELL AND CAN’T WAIT TO RETURN IN 2019. THANK YOU TO JAMIE FRENCH-PARKER, OUR CRUISE DIRECTOR, AND TO HER SUPERB TEAM, INCLUDING KRISTINA JACKSON, OUR PRODUCTION MANAGER. THEY MADE IT A TOTAL PLEASURE TO DO WHAT WE DO! NOW THAT WE ARE BACK ON THE MAINLAND WE ARE ENJOYING THE BUZZ OF THE HOLIDAYS WHICH IS EVERY WHERE. ALREADY MENU PLANNING AND DECORATING, WE ARE THRILLED TO GET INTO THE SPIRIT OF THINGS! OK, SO MAYBE WE ARE WORKING A LITTLE, PLANNING A NEW CD, BUT LET’S JUST KEEP THAT TO OURSELVES FOR NOW, OK? 2019 LOOKS TO BE A GREAT NEW YEAR OF CHANGE AND WE HOPE TO BE SEEING YOU ALL OUT AT SEA OR AT A LAND SHOW. DON’T FORGET THAT ON JANUARY 17TH WE WILL DO OUR NINTH ANNUAL FUNDRAISER AT ST. GABRIEL’S CATHOLIC CHURCH. ALL PROCEEDS COLLECTED WILL BE DONATED SO COME ON OUT FOR A 75 MINUTE SHOW AND HANG OUT WITH US ON OUR HOME TURF! CHECK OUT THE CALENDAR FOR DETAILS ANYTIME! THIS IS ALWAYS A SELL OUT SO GET YOUR TICKETS EARLY AS IT IS LIMITED SEATING. ARE YOU READY FOR ANOTHER ROUND OF PARTIES, GET TOGETHERS AND FAMILY TIME,? ?WE SURE ARE!! BE WELL, STAY HAPPY AND WE WILL SEE YOU SOON! WELL, THAT WENT FAST! IN AND OUT AND OFF TO HAWAII FOR ANOTHER BRIEF CONTRACT ABOARD THE PRIDE OF AMERICA, NORWEGIAN’S BEAUTIFUL SHIP THAT SAILS THE HAWAIIAN ISLANDS OUT OF HONOLULU. WE HAD A BLAST ON THE DAWN THIS PAST FALL, AND WE LITERALLY JUST UNPACKED FROM THAT TRIP, LOL! WE ALSO HAVE OUR ANNUAL FLORIDA FUNDRAISER CONFIRMED FOR JANUARY 17TH AT ST. GABRIEL’S CHURCH IN POMPANO BEACH. CONTACT MALCOLM MIEKLE FOR TICKETS AND DETAILS ABOUT THE SHOW OR TAKE A PEAK AT OUR CALENDAR HERE ON THE SITE. THIS JUST IN: NEW DATES FOR AUGUST 2019! MORE DETAILS AND CHANGES TO FOLLOW. HAVING A GREAT TIME HERE ON THE DAWN SAILING INTO BEAUTIFUL QUEBEC CITY OUT OF BOSTON HARBOR. THE CHANGING OF THE LEAVES IS SIMPLY MAGNIFICENT THIS YEAR! SUMMER IS HERE AND WE ARE HAVING FUN, ARE YOU? WELL, WE ARE BACK ON DRY LAND FOR THE SUMMER, AND WE HOPE YOU ARE ALL PLANNING SOME FUN WITH FAMILY AND FRIENDS, LIKE WE ARE! FOR THE FIRST TIME IN ALMOST 12 YEARS, WE HAVE TAKEN AN ENTIRE SUMMER OFF, TO DEDICATE TO RE-ALIGNING OURSELVES PERSONALLY, AS WELL AS TO PUTTING TOGETHER A NEW SHOW, AND ALSO TO SPEND SOME QUALITY TIME WITH OUR GROWING FAMILY AND OUR CLOSE FRIENDS. WE ARE SO GRATEFUL TO BE ABLE TO HAVE EACH OTHER AND TO HAVE YOU ALL SUPPORTING US AS WE CONTINUE OUR WAY THROUGH THIS JOURNEY WE CALL OUR LIFE. SO FAR, IT HAS BEEN FILLED WITH MUCH TRAVEL, VARIED NEW EXPERIENCES, INCREDIBLE FINE FOODS, AND WONDROUS AQUATIC ADVENTURES. WE HAVE BEEN ON MANY ROAD TRIPS, AND WE ARE AMAZED AT HOW WE HAVE AN EVER GROWING AND DEEP CONNECTION TO OUR FAMILIES AND FRIENDS, AS WELL AS OUR EVER BUILDING FANBASE. WE LIVE "ONE SHOW AT A TIME" AND FEEL WE ARE ONLY AS GOOD AS THE LAST PERFORMANCE, EAGER TO KEEP GROWING AND CHANGING.....WE WANT TO TAKE THIS OPPORTUNITY TO THANK ALL OF YOU WE HAVE BEEN HEARING FROM RECENTLY, AND WHOM WE HAVE HAD THE HONOR OF PLAYING MUSIC FOR. AS SOME OF YOU KNOW, WE HAVE JUST FINISHED A CONTRACT WHEREBY OUR NEW SHOW: "DIAMONDS, PEARLS, AND CASH" HAS BEEN VERY WARMLY RECEIVED! THANKS TO ALL THOSE WHO WATCHED IT ON THE NORWEGIAN DAWN. THANKS TO OUR AGENT AT SUMAN ENTERTAINMENT GROUP AND TO THE WILLIAM CLARE AGENCY FOR GETTING OUR NAME OUT THERE. THE BAND WE HAD ON BOARD THIS SPRING WAS FABULOUS, AND EACH PLAYER KNOCKED IT OUT OF THE PARK! IF YOU SAW THAT SHOW, YOU KNOW WHAT WE MEAN......WE WILL BE BRINGING THIS SHOW TO SOME OF THE STATES UP NORTH, AS WELL AS TO BOTH COASTS OF FLORIDA SOON! CAN'T WAIT! IT CONTINUES TO BE OUR PLEASURE TO PLAY MUSIC, TO TRAVEL, AND TO BE HEARD. HERE'S TO DAYS FULL OF SUNSHINE AND JOY, AND MAY WE ALL CONTINUE TO LIVE, LOVE AND PLAY MUSIC! CHEERS TO YOU ALL!! OUR VIEW FROM THE FERRY IN BERMUDA AS WE SAILED INTO HAMILTON EACH WEEK. USUALLY ON A DAY OFF. So proud to be a part of this great cause. Hope to do another show there soon! Thanks to all of who came out in support. We had a blast! Tell two friends...and they can tell two friends....click on the arrow to see the full article. Greetings from the Norwegian Dawn, where we are presently sailing somewhere in the Gulf of Mexico, between Belize and Tampa, Florida. We just finished our first two weeks back at sea and have been having a blast, for sure. The Atrium has been packed and we are enjoying the families on board this holiday season. We have met a lot of new friends and fans too. Dave the cruise director is here with us, along with Luz as ACD! Come on out to see us all. We also debuted our new show called "Neil Diamond and Friends" in the Stardust Theater to an amazing reception and it looks like we will be performing this show every week. We have added some iconic music to the show and it features the legends you know and love! WELL, IT LOOKS LIKE WE SET A RECORD AT ST. GABRIEL'S! THANKS TO ALL OF YOU WHO CAME TO OUR SHOW, AS WE SOLD OUT AT 371 TICKETS AND FILLED THE HALL TO CAPACITY. WE ARE NOW IN THE TALKS TO TRY TO GET INTO THE POMPANO BEACH AMPHITHEATER FOR NEXT YEAR'S FUNDRAISER. ANYTHING IS POSSIBLE AT THIS POINT, AND WE MAY JUST INVITE SOME GUEST PERFORMERS AS WELL! AS YOU ALL KNOW, 100 PERCENT OF THE PROCEEDS WENT TO FATHER TONY, AND SO WITH $7,420 THEY SURE CAN HELP A LOT OF PEOPLE IN NEED. AS WE MENTIONED IN THE SHOW, TELL TWO FRIENDS AND WE WILL FILL THE BIGGER THEATER. WE ARE PRESENTLY ON LAND, AND WE ARE DOING A MINI-TOUR OF THE WEST COAST OF FLORIDA. WE APPEARED IN SOME PRIVATE COMMUNITIES AND ALSO AT THE PASCO HERNANDO COLLEGE PERFORMING ARTS CENTER, WHERE WE HAD ANOTHER SOLDOUT SHOW! THANKS TO ALL WHO CAME OUT. CHECK OUR CALENDAR FOR THE SHOWS IN MARCH, AND WE HOPE TO SEE YOU AT THOSE UPCOMING SHOWS. HAVE A GREAT WEEK AHEAD EVERYONE AND AS ALWAYS, BE CAREFUL OUT THERE!! Aloha and Mahalo A HUI HO! We have just returned from a month aboard the Pride of America, which sails out of the Hawaiin Islands. It was a beautiful trip and we had a great time meeting people from all over the world, including China, Japan, Australia, Argentina, and the beautiful states of ours in the US! We saw whales, volcanoes, beaches and even the lunar eclipse, which just blew us away. It's never lost on us that we are a lucky couple, who get to travel and do what we love, together. Check out our Facebook Fan Page JOSE AND PATTI, where you can see our photos from this recent adventure! Thursday we have our SOLDOUT annual Fundraiser at St. Gabriel's Catholic Church. We will headline this variety show and perform for our local community, while giving 100 percent of the proceeds to our church through Father Tony, our pastor. This is his final year before retiring and we know it will be a high energy and emotionally charged event. We really can't wait to see you there! THANK YOU ALL for making it a sellout. Florida based Fundraiser February 8, 2018. Happy holidays everyone! We hope that this is finding you surrounded by loved ones and with full and peaceful hearts. 2018 is just around the corner and we wish you all prosperity, health and joy in what lies ahead these next few days and weeks! On February 8th, we will be performing our Jose and Patti Variety Show at our Annual Fundraiser to raise money for our local parish. Showtime is at 7:00-8:15PM at St. Gabriel's Catholic Church, 731 North Ocean Blvd. Pompano Beach, Florida. 33062. We will perform in the Parish hall. Donation at the door is $20/p.p., and will include a social hour, starting at 6PM, with wine, beer, cookies and appetizers. Come early and meet your neighbors and fellow music fans! Please call Malcolm Miekle at (207) 831-0385 for all details and information regarding ticket sales, seating, and more. Tickets will sell out, so we suggest getting them soon. This will be father Tony's last year at the church as he is retiring in June, so we plan to send him off in style, and raise the biggest amount, in His name, yet! We can't wait to see you all then! Happy New Year everyone! Stay well, be safe and may 2018 be the best year yet for you all! CHANGES,NEWS AND THANKS: FUNDRAISER AND SHOW, NOV. 18TH. 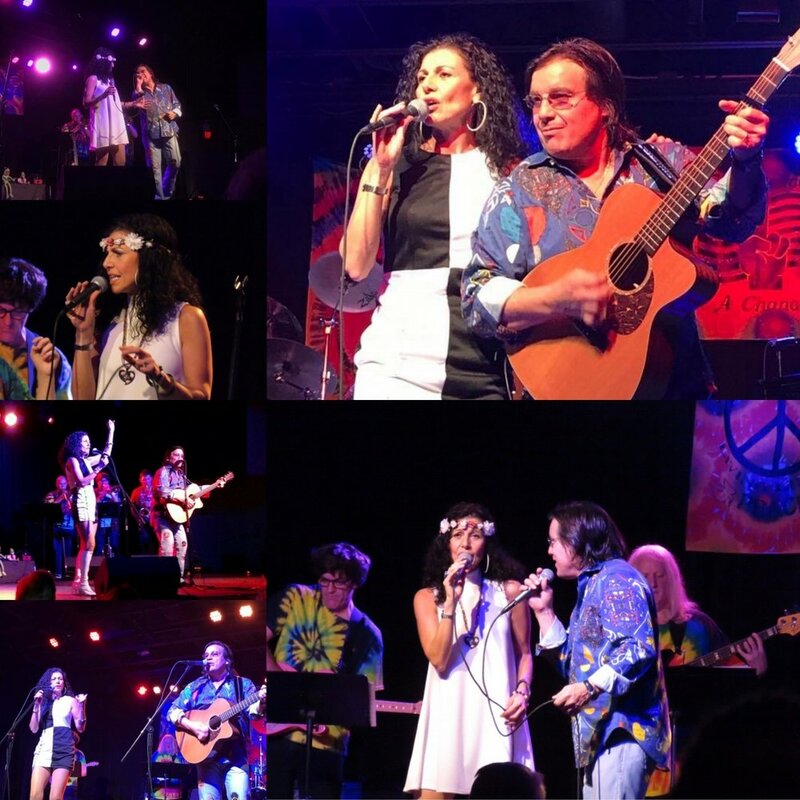 THANK YOU TO ALL WHO ATTENDED THIS SOLD-OUT FUNDRAISER AT THE BLUE OCEAN MUSIC HALL IN SALISBURY, MASSACHUSSETTS. BOTH LARRY AND EILEEN GIORDANO, THE FOUNDERS OF THIS HOME AND FACILITY FOR FOSTER KIDS, EXTEND THEIR TREMENDOUS GRATITUDE TO ALL THOSE WHO CAME TO OUR SHOW, PARTICIPATED IN THE EVENT, AND MADE IT A WONDERFUL SUCCESS. PLANS ARE IN THE WORKS NOW TO BUILD A TRANSITION HOME FOR THE 18 YEAR OLDS THAT GET KICKED OUT OF THE SYSTEM ONCE THEY REACH LEGAL AGE. IF YOU WOULD LIKE TO MAKE AN ADDITIONAL DONATION WE URGE YOU TO DO IT! WE HAD A WONDERFUL TIME WITH OUR BAND, WHO ARE ALL BASED IN THE NEW ENGLAND AREA. WE HOPE TO DO IT AGAIN NEXT YEAR IF WE ARE LUCKY! HAPPY BELATED THANKSGIVING TO ALL OF OUR FAMILY AND FRIENDS. WE WERE SO BUSY EATING TURKEY THAT WE FORGET TO MAKE A POST! WE SURE HOPE THAT ALL OF YOU WERE ARE BLESSED AS WE WERE TO SHARE TIME AND SPACE WITH LOVED ONES. WE HAVE A LOT TO BE GRATEFUL AND THANKFUL FOR, THAT'S FOR SURE. LASTLY, WE MIGHT BE MAKING SOME CALENDAR CHANGES IN 2018 FOR THE HAWAII DATES. PLEASE BE PATIENT WITH US, AS WE AWAIT NEWS. WE WILL MAKE ANY NEW POSTS AND CHANGES AS THEY COME IN AND IT MAY TAKE A FEW WEEKS FROM NOW...THANK YOU. SOLD OUT SHOW AT SALISBURY!!! Less than two weeks to go and we will be headlining a fundraiser on November 18th for the Foster Kids of Merrimack Valley at the Blue Ocean Music Hall in Salisbury, MA. It is officially sold out, and we are more than excited to see you all while raising money to build a new home for those that need it most. Thank you Thank you Thank you to all who have made this show a possibility! We are finishing up an incredible Fall season here on the Norwegian Dawn, and head home soon...Hope to see you all either at the show, or in Hawaii in January, or maybe at one of our land shows in Florida in the Spring. The summer parties are beginning to wind down, those warm skies are getting smoky, and the nights begin to lengthen. We hope that you all had a fantastic summer full of great memories. We cannot believe that we have less than two weeks to go, and we get back to work. Where did that time go? We had lots of downtime, studio time, and travels galore. We saw friends and family, climbed mountains, rode horses, swam in beaches/ hot and cold springs and pools, made comfort homestyle dinners, flew the skies, took road trips, and finally, celebrated and rejuvinated our bodies and souls. We joined Bart Delaney of Suman Entertainment for three sessions this summer and played with his band (known as A-Band-On-Ship) at the Hard Rock Miami. (see photo below) We had the pleasure of meeting and playing with some great musicians from around the world and cannot thank Bart enough for those great jams - even for the day we got totally waterlogged under a true Miami downpour!! Now after almost three months at home and on land, we are getting ready for another New England season on the high seas! WHEW! We have just updated our calendar right through the end of 2018 as well, so check that out at the above link if you are planning any trips to the high seas either in New England, Tampa, Bermuda or in Hawaii...we will see you there. New Jose and Patti Cafe Press shop! New items for 2017! This summer we are truly mixing work with pleasure as we are on dry land for a few months. We will be working hard on new shows, new sites, new music and new adventures. Jose is busy recording some industrials for Temple University's Law Department, and also making music for a World Tour group about to head out to tour China and South America. Patti is working on some new original tunes with her co-writer and running miles and miles each morning. On a personal note, later in the season, we will be going to a highly anticipated family reunion in South America as well. We will experience some very exotic lodgings while we are there. (Patti is hoping to make it to the "Swing at the top of the world", so we will keep you posted on that). We hope that whatever you do this summer, it brings you joy and good times with the ones you love! That beach has been calling out to us and we cannot refuse. Hope you heed the call too. Here's something fun: Check out our new flip-flops available on our Cafe Press site: They are perfect for those sandy days ahead. WOW! - what a night we had at the Palace Theatre this past weekend in beautiful New Hampshire. Our good friend and very funny comedian, Joe Yannetty, had the house in stitches as the opening act, and we all raised ANOTHER $10,000!!! for the New Hampshire Prostate Cancer Coalition. We want to thank each and every one of you who attended and helped make this 3rd Annual Jeff Kantor evening possible. 27 local businesses were involved, and Mr. Richard Hatin, along with the Board of Directors of the Palace Theatre had another very fruitful and very succesful event. We are so grateful to our friends, followers and fans for all the time you spent getting to New Hamsphire, bringing friends, taking photos and chatting with us and supporting our efforts. If you have photos or videos to share please go to our Facebook page or send us links on You Tube for all to see. The incredible sounding 7-piece band we had the privilege of playing with was led by Mr. Whit Privette, and they were on FIRE!! If you were there, you know what we are talking about. These guys "smashed" it! They will be with us again when we perform in Salisbury later this year. See below for more on that show. We are NOW CONTINUING all the planning stages for another benefit show on November 18th, 2017. This will take place at the Blue Ocean Music Hall, in Salisbury MASS. and will raise money for Foster Kids of Merrimack Valley, Inc. When the kids turn 18, they need a place to live, and hopefully we can help to give them a real home.....see: www.fosterkidsmv.org for info and donation information. Please click "schedules" above for details and contacts, and ticketing information. Ticketmaster also has tickets available for this show. LASTLY, THANKS AGAIN TO EVERYONE WE HAD THE PLEASURE OF MEETING AND WORKING WITH ON THE PRIDE OF AMERICA IN JANUARY. WE WILL BE RETURNING THERE, TO SAIL THOSE BEAUTIFUL ISLANDS, WHILE BRINGING WITH US TWO FULL STAGE SHOWS! CHECK THE SCHEDULES PAGE (ABOVE) FOR UPDATES SOON!!! Click the "SCHEDULES" link above for any our SHOW DATES, information, and more. Scroll down the calendar for all the latest. WE ARE NOW GETTING CALLS FOR 2018 BOOKINGS AND WE'LL LET YOU KNOW THE WHERES AND WHENS AS SOON AS WE ARE ABLE. WE ARE ALSO PRESENTLY UPDATING AND GETTING CONFIRMATIONS ON MANY SHOWS ON THE WEST COAST OF FLORIDA WHERE WE WILL BE APPEARING IN THE SPRING OF 2018. WE ARE GETTING DAILY CONFIRMATIONS AND WILL POST ANY AND ALL INFORMATION REGARDING EACH SHOW AS SOON AS IT COMES IN THROUGHOUT THESE NEXT FEW WEEKS AND MONTHS AHEAD...THANKS TO EVERYONE AT THE WILLIAM CLARE AGENCY FOR REPRESENTING US FOR THESE CONCERTS. Finally, we thank you for stopping by and checking in on us, and be careful out there!